Illustrated song lyrics for Bartholomew Fair as sung by Mr Mathews. The illustrated panel shows Bartholomew Fair in chaos. In the commotion, a Punch and Judy theatre is in the process of being knocked over. Published in London by Laurie & Whittle. 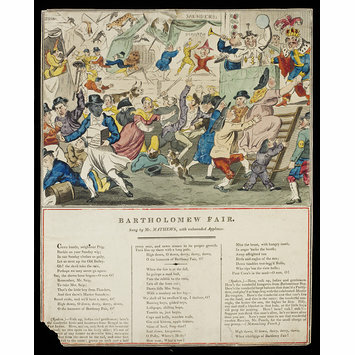 Hand coloured and etched illustrated song lyrics for Bartholomew Fair as sung by Mr Mathews. 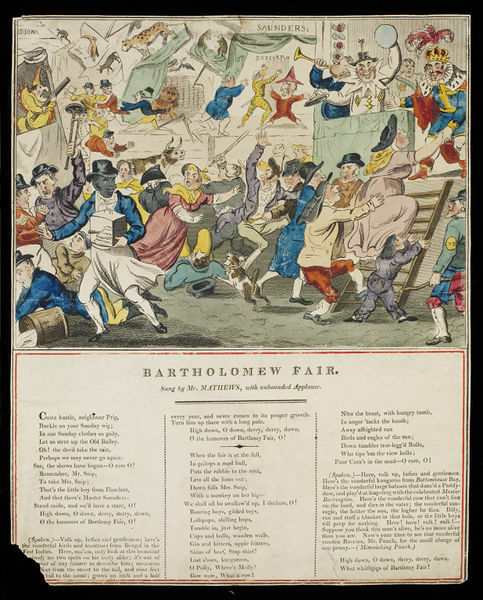 Illustrated song lyrics for Bartholomew Fair as sung by Mr Mathews. Published in London by Laurie & Whittle on 30th January 1811, George Speaight Punch & Judy Collection.